This volume of six linked stories and the novella from which the book derives its title is set in Port William from 1908 to the Second World War. 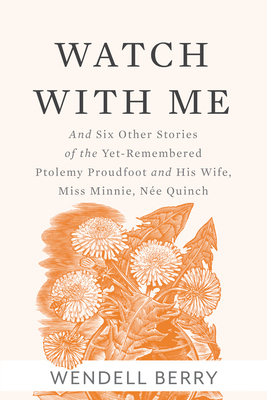 Here Wendell Berry introduces two of his more indelible and poignant characters, Ptolemy Proudfoot and his wife Miss Minnie, remarkable for the comic and affectionate range that--with the mastery of this consummate storyteller working at the height of his powers--here approaches the Shakespearean. Tol Proudfoot is huge, outsized, in the tradition of the mythic. The three-hundred-pound farmer, personally imposing and unkempt, is also the most graceful of presences, reserved and gallant toward his tiny wife, the ninety-pound schoolteacher. Their contrasts are humorous, of course, and recall the tall tales of rural Americana. In the novella Watch with Me, we are given a story of such depth, breadth, and importance it earns being listed as one of the most important short stories written in the American language during the twentieth century. WENDELL BERRY, an essayist, novelist, and poet, has been honored with the T.S. Eliot Prize, the Aiken Taylor Award for poetry, the John Hay Award of the Orion Society, and the Richard C. Holbrooke Distinguished Achievement Award of the Dayton Literary Peace Prize, among others. In 2010, he was awarded the National Humanities Medal by Barack Obama, and in 2016, he was the recipient of the Ivan Sandrof Lifetime Achievement Award from the National Book Critics Circle. He is also a fellow of the Academy of Arts and Sciences. Wendell lives with his wife, Tanya Berry, on their farm in Henry County, Kentucky.